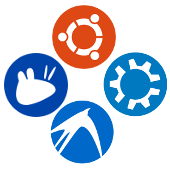 Very recently, Ubuntu 14.04 was released. And I wanted to download the different flavours of the Ubuntu GNU/LINUX. I was sighing as I had only a really slow internet connection. And then came to know about Zsync . It really saves your bandwidth on downloading the different flavours of Ubuntu. Lets say, you have Ubuntu 14.04 ISO and want to download Ubuntu GNOME 14.04. What will you do ? Download both of them completely ? That would work great, if you've got plenty of Internet Speed and Unlimited Bandwidth and patience too. But for people like me, who have slow internet connection or limited bandwidth, we cannot afford to do so. So, using this method, you can save your bandwidth and time. When I downloaded Ubuntu GNOME with having Ubuntu ISO image already with me, only 25% of the Ubuntu GNOME ISO needed to be downloaded and the rest was taken from the Ubuntu ISO that I already had. zsync is a file transfer program. It allows you to download a file from a remote server, where you have a copy of an older version of the file on your computer already. zsync downloads only the new parts of the file. For all linux distros, you can download the tarball and install from it. Check out ZSync downloads page to know more. Thus you have an ubuntu ISO image already, and using this, you'll download the rest of the flavours. Download any one flavour first. This will act as the base for downloading others. Then head to the Ubuntu releases page. Then copy the link address for the zsync file. Thats it, and after that you can also continue with the other flavours.